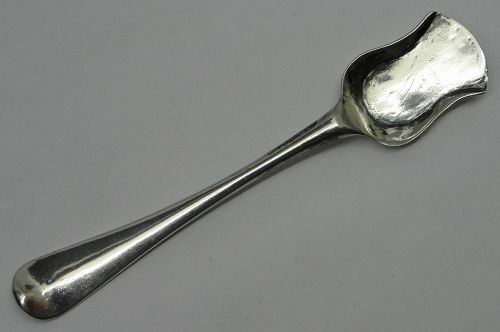 Offered is a rare 270-year old Norwegian master salt spoon by Frederikshald (now known as Halden) silversmith Lorentz Hoffman (alternate spelling, Hofmand), who was born circa 1692 and died in 1767. This piece is marked LH over 1746 for the maker's mark and year of manufacture, and FH for Frederikshald. These marks appear in "Norske Solvstempler" by Jorunn Fossberg, page 29. The third mark may be an assay master's mark, but I can't be certain. It is quite uncommon to see domestic Norwegian silver this early, beyond special marriage spoons, etc. This salt shovel is about 3 5/8 inches in length and weighs about 6 grams. There is no monogram or armorial, and no sign of erasure. Condition is very good overall, with no dents or repairs, and only one tiny (1 mm) fissure on the bowl that doesn't affect the integrity or appearance of the piece at all. Please click on the picture to see all pictures, including a closeup of this feature. All in all an excellent piece of Norwegian silver, over a quarter of a millennium old!